The Douglas B-66 Destroyer was a U.S. Air Force Tactical Air Command light bomber based on the United States Navy's A-3 Skywarrior. It was intended to replace the Douglas A-26 Invader. An RB-66 photo-reconnaissance version was ordered simultaneously. The B-66 retained the three-man crew from the A-3. At first, the USAF thought the conversion would be an easy matter of removing the carrier-specific features, so no prototypes were ordered, just five pre-production RB-66A models (the reconnaissance mission being considered a higher priority). The list of modifications grew, and before long, the supposedly "easy" conversion became what was a substantially new aircraft. Many of the changes were due to the Air Force's requirement for low-level operations, while the Navy version was originally designed and initially employed as a high-altitude nuclear strike bomber. Two major differences between the A-3 and the B-66 were in terms of powerplants and emergency crew egress systems. In terms of engines, the A-3 had two J57 turbojet engines, while the B-66 had two Allison J71s. Secondly, the B-66 was equipped with ejection seats while the A-3 was not. The first RB-66A preproduction aircraft flew in 1954, while the first production RB-66B aircraft flew in early 1955. The basic B-66 "Destroyer" design proved itself to be a versatile one, and was produced or modified into a variety of versions, including the EB-66, RB-66, and the WB-66. Likewise, the A-3 Skywarrior was used as the A-3, EA-3, KA-3, EKA-3, TA-3, RA-3, ERA-3 and the UA-3. Deliveries to the USAF began in 1956 with 145 of this model produced. RB-66s were used as the major night photo-reconnaissance aircraft of the USAF during this period. A total of 72 of the B-66B bomber version were built, 69 fewer than originally planned. Thirteen B-66B aircraft later were modified into EB-66B electronic countermeasures aircraft for the Vietnam War. Unlike the Navy's A-3 Skywarrior, which performed some bombing missions, the Destroyer was not used as a bomber in Vietnam. 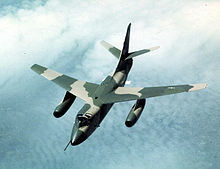 The RB-66C was a specialized electronic reconnaissance and ECM aircraft with an expanded crew of seven, including additional electronics warfare experts. A total of 36 of these aircraft were built with the additional crew members housed in what was the camera/bomb bay of other variants. RB-66C aircraft had distinctive wingtip pods and were used in the vicinity of Cuba during the Cuban Missile Crisis and later over Vietnam. In 1966, these were redesignated EB-66C. On 10 March 1964, a 19th TRS RB-66C flying on a photo-reconnaissance mission from Toul-Rosix�res Air Base in France was shot down over East Germany by a Soviet MiG-21 after it crossed over the border due to a compass malfunction. The crew ejected and were taken prisoner briefly before being repatriated. The final B-66 variant was the WB-66D weather reconnaissance aircraft, 36 of which were constructed. The EB-66C/E was removed from USAF service by 1975 and most examples either scrapped in place or placed in storage for eventual scrapping. One RB-66B is on display at the National Museum of the United States Air Force at Wright-Patterson Air Force Base near Dayton, Ohio. Other examples on display are located at: Shaw AFB, South Carolina; Lackland AFB, Texas; Robins AFB, Georgia; Dyess AFB, Texas; the Chanute Aerospace Museum at the former Chanute AFB in Rantoul, Illinois and the Pima Air and Space Museum adjacent to Davis-Monthan AFB in Tucson, Arizona. (Douglas Model 1326) All-weather photo-reconnaissance variant, five built. (Douglas Model 1329) Variant of the RB-66A with production J71-A-13 engines and higher gross weight, 149 built. (Douglas Model 1327A) Tactical bomber variant of the RB-66B, 72 built. One B-66B used for testing and a RB-66B used for F-111 radar trials. Four RB-66Cs with uprated electronic counter measures equipment. Electronic weather reconnaissance variant with the crew compartment modified for two observers, 36 built with two later modified to X-21A. Specialised electronic reconnaissance conversion of the RB-66B. Picture - Douglas EB-66E Destroyer in flight. Aircraft of the 355th Tactical Fighter Wing, 41st or 42nd TEWS based at Takhli Royal Thai Air Force base over Southeast Asia on 30 March 1970. 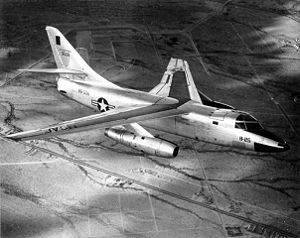 The Northrop X-21 modified the WB-66D with an unusual wing to conduct Laminar Flow Control studies. Laminar-flow control was thought to potentially reduce drag by as much as 25%. Control would be by removal of a small amount of the boundary-layer air by suction through porous materials, multiple narrow surface slots, or small perforations. Northrop began flight research in April 1963 at Edwards Air Force Base, but with all of the problems encountered, and money going into the war, the X-21 would be the last experiment involving this concept. The shooting down of an EB-66 over North Vietnam became the subject for the book Bat*21 by William Charles Anderson, and later a film version (1988) starring Gene Hackman and Danny Glover. The story depicts the controversial rescue of Lieutenant Colonel Iceal Hambleton, USAF, the senior navigator/electronic warfare officer of an EB-66 (call sign "Bat 21"), and only survivor after the aircraft was struck by a surface to air missile on 2 April 1972. Lt Col Hambleton landed in an area containing over 30,000 North Vietnamese forces that were about to be ambushed and attacked by South Vietnamese forces. As a result, the attack was canceled while efforts were made to secure the rescue of Lt Col Hambleton. The delay resulted in the loss of an indeterminate but sizable number of South Vietnamese soldiers as their positions were overrun, before American advisers initiated artillery attacks on the enemy forces in defiance of orders. Nine additional aircraft and helicopters were badly damaged during the rescue attempts, most never to fly again. The OV-10A weapons officer/observer who was rescued, was General Mark Clark's grandson. Baugher, Joe. "Douglas B-66 Destroyer." USAAC/USAAF/USAF Bomber Aircraft: Third Series of USAAC/USAAF/USAF Bombers, 2001. Retrieved: 27 July 2006. "Douglas RB-66B 'Destroyer'." National Museum of the United States Air Force. Retrieved: 27 July 2006.